- The game would reset all relationship decay values to their original values whenever you planned an outfit or traveled. This little annoyance was corrected by completely rewriting the mod's code to account for the mess this made. - The mod is now much more efficient. The Sims 4 has taken a page out of The Sims 2's book by making it spectacularly easy to become a social outcast. Many people were complaining that relationships decay too quickly, so it was about time a mod was made for this. I have made a mod that comes in two different flavors (by popular request, the second flavor has been added). The first flavor of the mod ("mgomez-noreldecay.zip") will eliminate relationship decay completely. 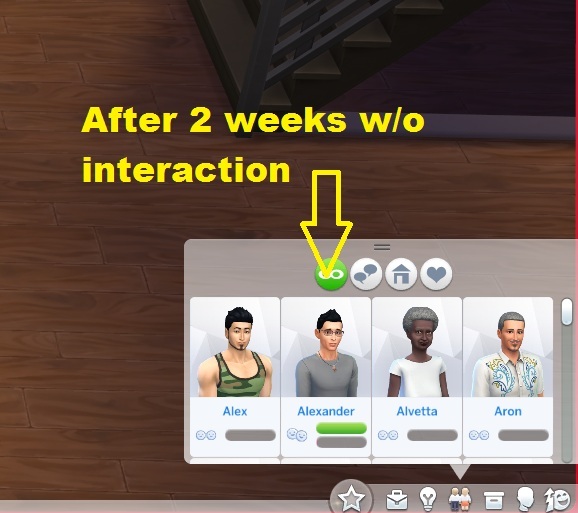 A screenshot below shows how the relationship between Darla Parker (my guinea pig sim family's daughter) and Alexander Goth played out after two weeks of completely ignoring the poor boy. "noreldecay" will not decay romantic relationships, either (in other words, choose wisely whom you romance). The second flavor of the mod ("mgomez-relationshipdecay.zip") will allow you to configure relationship decay as a percentage of the original decay rate hard-coded into the game. You can see a screenshot of it in action below. ATTN: This mod saves your configurations so you don't have to type them ever again. Just set it and forget it! friendship.decay [percent] - Slow down the decay of friendship at a certain percentage compared to the original decay rate. romance.decay [percent] - Slow down the decay of romance at a certain percentage compared to the original decay rate. I dare you to type a negative value. Try it! This mod comes in two flavors, so you'll have to choose one to download. Do not install both, or "mgomez-noreldecay.zip" will take precedence (it will override whatever you do in "mgomez-relationshipdecay.zip"). To install this mod, copy the zip file (do not extract it or ninjas will come to your house!!) to your Documents\Electronic Arts\The Sims 4\Mods folder. When in your game, go to your Options menu (the three dots on the top right-hand corner), and navigate to "Game Options > Other". Fill the box next to "Script mods" by clicking on it. Lastly, make sure you enjoy the heck out of this mod! 1: You may have extracted the files in the ZIP. To install scripted mods, the PYO files must remain inside of the zip file at all times. No extraction is necessary. Plop the zip file into your Documents\Electronic Arts\The Sims 4\Mods folder. 2: You have not yet enabled scripting mods. 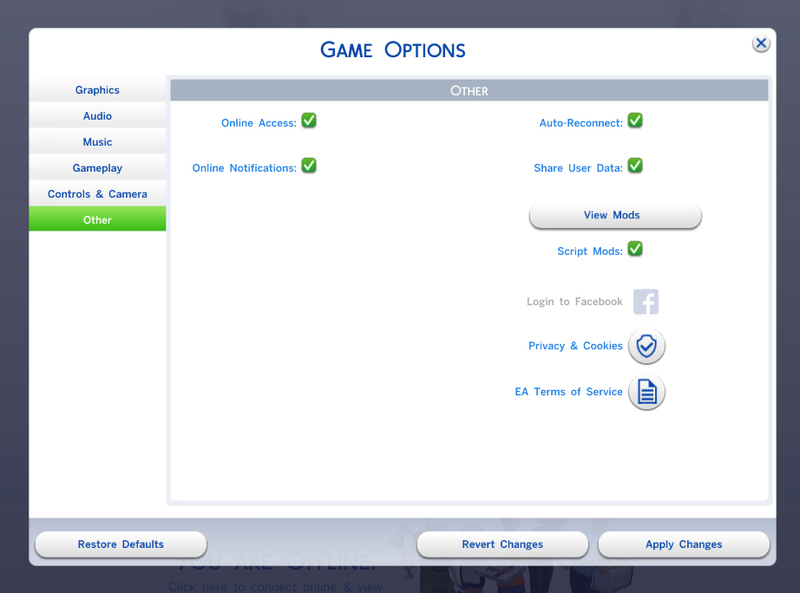 In this case, go to your options menu (the three dots) and navigate to Game Options > Other > Script mods. The box next to "Script mods" should be filled. 3: You are not using the latest update of The Sims 4. In order for this mod to work, you need to be using at least the September 9th patch. There was a bug in the game that completely ignored non-replacement script mods. This mod is one of those (i.e. it doesn't replace an entire in-game module). 4: If you have the 9/9 patch and it's still ignoring the mod, restart your game without any mods (including Resource.cfg), stop the game (again), put the mods back in, then start it again (in short: Start Sims 4 with an empty mods folder, then start it with mods again). This was a problem that really annoyed me when I was developing, but it so happens that Sims 4 retains behavior from before the 9/9 patch if you don't do this. 5: There could be a conflicting mod with this one. Try the game with only this mod loaded and see if it works. Post which other mods you run here so that I may test them and find out how I can make them compatible, if there are any compatibility issues. mgomez-relationshipdecay.zip | Description: This mod will allow you to configure your own relationship decay rates for both friendship and romance separately. mgomez-noreldecay.zip | Description: This mod will eliminate relationship decay entirely, for everyone.